In Greek mythology Phrixus (/ˈfrɪksəs/; also spelt Phryxus; Greek: Φρίξος, Phrixos) was the son of Athamas, king of Boeotia, and Nephele (a goddess of clouds). He was the twin brother of Helle and the father of Argus, Phrontis, Melas and Cytisorus by Chalciope, daughter of Aeetes, king of Colchis. Phrixus and Helle were hated by their stepmother, Ino. She hatched a devious plot to get rid of the twins, roasting all of Boeotia's crop seeds so they would not grow. The local farmers, frightened of famine, asked a nearby oracle for assistance. Ino bribed the men sent to the oracle to lie and tell the others that the oracle required the sacrifice of Phrixus and Helle. 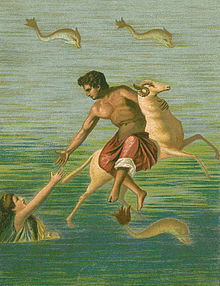 Before they were killed, though, Phrixus and Helle were rescued by a flying, or swimming, ram with golden wool sent by Nephele, their natural mother; their starting point is variously recorded as Halos in Thessaly and Orchomenus in Boeotia. During their flight Helle swooned, fell off the ram and drowned in the strait between Europe and Asia, which was named after her the Hellespont, meaning the sea of Helle (now Dardanelles); Phrixus survived all the way to Colchis, where King Aeëtes, the son of the sun god Helios, took him in and treated him kindly, giving Phrixus his daughter, Chalciope, in marriage. In gratitude, Phrixus sacrificed the ram to Zeus and gave the king the Golden Fleece of the ram, which Aeëtes hung in a tree in the holy grove of Ares in his kingdom, guarded by a dragon that never slept. Phrixus and Chalciope had four sons, who later joined forces with the Argonauts. The oldest was Argos/ Argus, Phrontis, Melas, and Cytisorus. Depiction of Phrixos flying on ram to Colchis on AE dichalkon struck in Halos, Phthiotis in 3rd century BC. ^ Flying is conventional in modern treatments, but see D. S. Robertson, "The Flight of Phrixus", The Classical Review, Vol. 54, No. 1 (Mar., 1940), pp. 1–8.